First and foremost, this isn't The Times newspaper's app. What it is, is an RSS aggregator that displays news feeds in great-looking categories and columns, which you can customise to taste. Once you're subscribed, tap a story and the page folds over, revealing the contents of the feed article, which you can view inline or as a web page. There's also 'read later' functionality, like Instapaper – handy if you want to cache articles to read when you'll be without a mobile or Wi-Fi signal, such as on a train or plane journey. 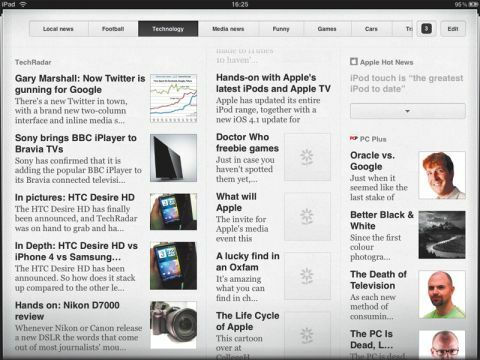 What Times doesn't do is integrate with Google Reader, so adding feeds can be tedious, especially since there's as yet no multitasking on the iPad, so you can't just pop into Safari to grab a feed URL. The app does a good job of picking up news feeds if you just give it a general URL, though, and if there's more than one feed available, it offers you a list to choose from.